Teak has been sought after for many centuries for its beauty and durability. It’s been used to make boats, furniture and in the construction of houses. Aside from its striking grain patterns, it is strong, termite, fungi and dry rot resistant. Like a fine wine, teak improves with age. Its popularity and slow growth of teak trees (around 80 years for timber) has seen naturally-growing teak become a rarity and consequently protected; so much of the teak products made today are from plantations. However, given so much teak was used in Thailand for the construction of houses and its long life as a timber product; old-growth teak used in neglected structures is being given new life. So sought after is the material that use of reclaimed teak is heavily regulated. 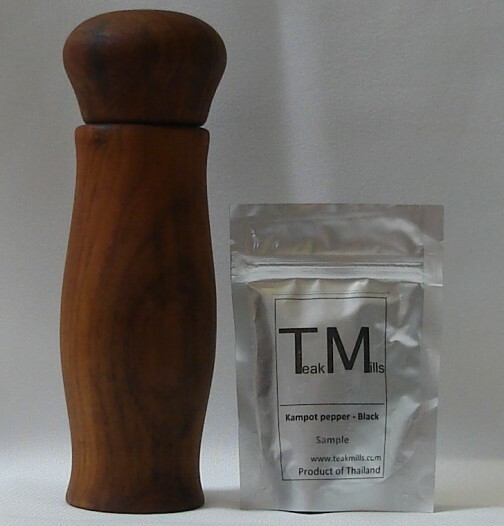 One example of a reclaimed teak product is this pepper mill I recently received from Andre Park, owner of Teak Mills; which is based in Northern Thailand. My photo really doesn’t do it justice – there are better pics on Andre’s site. Made from old wooden hand rails, the fine-grained teak is graded and the best pieces used for the mills; which are hand finished by Burmese craftsmen. The pepper mill ceramic grinding mechanism, which has fourteen settings, is made by CrushGrind Denmark and is guaranteed for 25 years. At 220mm long x 75mm diameter (~ 8.6 x 3 inches), it has a large peppercorn storage capacity and the large diameter makes grinding a breeze – it’s very comfortable to use. Andre included some Kampot peppercorns as well. I used to think pepper was pepper; but a whiff of the Kampot’s aroma soon set me straight. I christened it on a salad today and it certainly added a new dimension – and a little goes a long way. The pepper gets its name from the region where it is grown; Kampot Province in southern Cambodia. Apparently the region used to produce to be the most sought after pepper in the world until the Khmer Rouge regime wiped out production. Around 20 years ago, the industry started up again and it’s now really starting to take off. The history of this pepper mill makes it a very interesting piece – and I love having useful items made from reclaimed or recycled materials that may even outlast me.